I mistake the first marker for a bit of red paint smeared on a fence post. 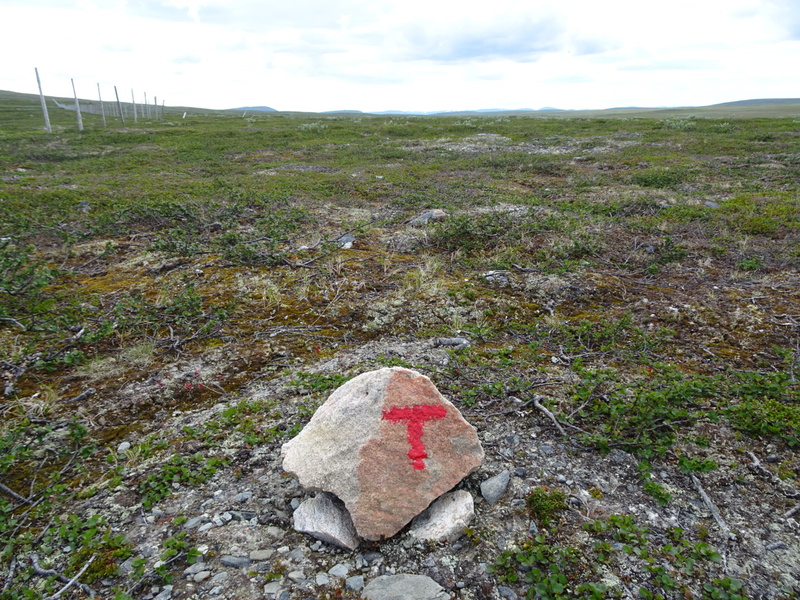 Then I find a second red tipped post, then a rock with a faded red T. The E1 stretches in front of me, the trail heading from Nordkapp to Sicily, the one that got this whole idea started in my head. I stop and stare at the red paint, expecting to feel something for it like I feel for the famous white blazes of the Appalachian Trail. But it’s just paint on a rock now. It doesn’t mean anything yet. I haven’t poured enough of myself into it. I walk along it for a while, sometimes following the markers, sometimes drifting away from them. After a mile or so, I turn the trail and say goodbye. “I’ll be back in a week,” I say. I need to go west toward the nearest road, to hitch a ride to Nordkapp and Knivskjelodden, Europe’s other northern points, to connect my steps from there with my steps from Kinnarodden before turning south. Posted in Europe North to SouthTagged backpacking, blazes, E1, ENS, Europe North to South, featured, hiking, Hiking the E1, linesBookmark the permalink. You are correct, mathematically there should be just one. I admire you tenacity. To cover all the ground and satisfy the need. Much like you did on the CDT, you took all the long routes… Nice. I so enjoy that your journey is in the moment and timeless… No hurrying to get there, wherever that is. Sort of like true north and the magnetic north.